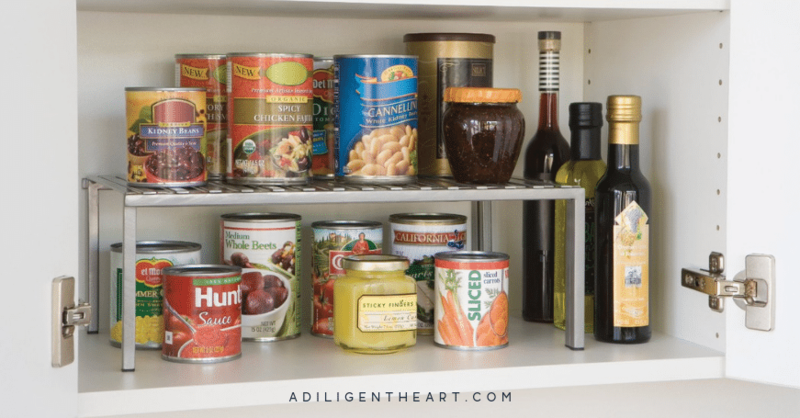 Have a small pantry in your home? 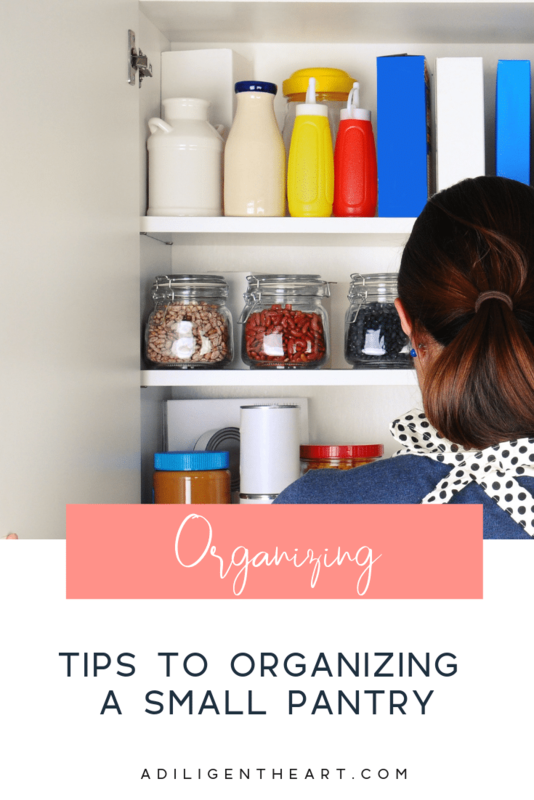 Struggling with how to keep it organized, stocked, and keep tabs on everything you do have? Keep reading for some tips on how to do all of this in any small pantry. In a family home, having an organized kitchen pantry is essential. It helps with meal planning and it helps you know what you have and what you don’t have. Ultimately saving you some extra cash! I can’t tell you how many times I would go grocery shopping only to come back home and find out that I had plenty of what I had just stocked up on at the grocery store. If we had extra storage in our kitchen, that wouldn’t be an issue – but our pantry is super small, so we only have what we need….plus a couple of back-ups. The kitchen pantry I have now is by far the smallest one I’ve ever had. And, like I’ve mentioned – it’s the only food shelf storage available in our kitchen. 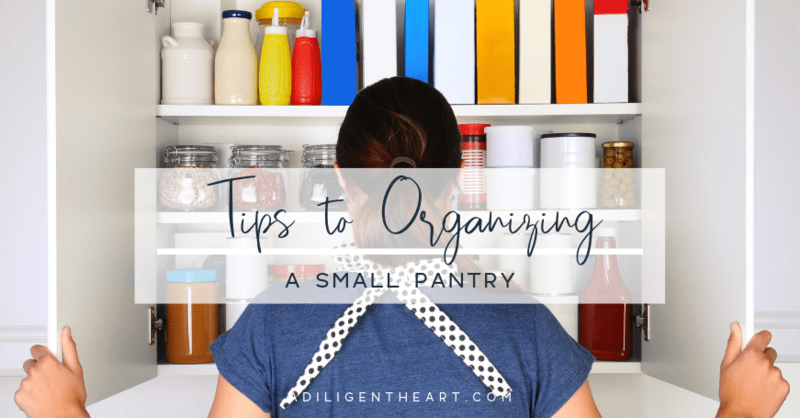 Here are some tips to keeping your small pantry organized and a printable to help you keep tabs of your inventory. At the moment, I don’t have any fancy organizers or dividers. It’s not an expense I feel like spending on at the moment. We live in a rental, so I can’t really bring myself to invests in something tailored to this size of this pantry, only to have no use for it when we get into a permanent home. I do however have these racks which are super affordable. In essence, they create an extra shelf in our pantry. 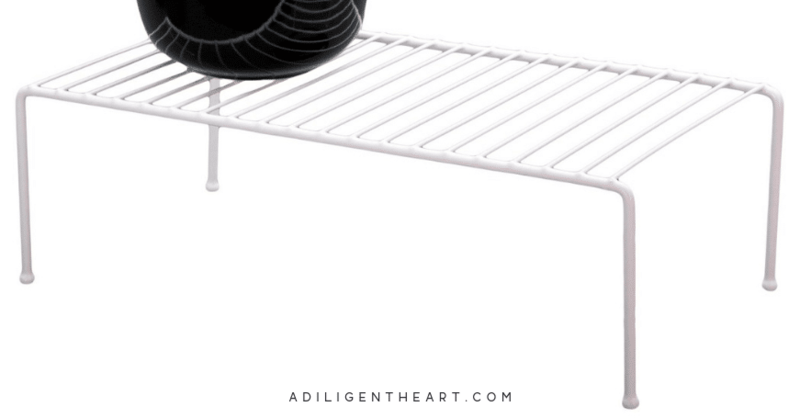 I like that they are racks, and not solid surfaces – because I am able to see through the top and sides to help me visually gauge what is there. You can find this one above on Amazon here. You can also find the one below like this one, this one, and these on Amazon too. Categorizing items is essential in small place organization. You have to keep things grouped together so that you know what’s going on. I keep my soups all lined up, my tomato sauces and purees together, our canned veggies (should we have any), and so on. I also try to define each shelf. Meaning I have one shelf for all things baking, one shelf for all things general cooking (think main meals), and a shelf for breakfast items like granola, cereal, or oatmeal. At the very top of my pantry there is a shelf. It’s the tallest space in the pantry and it’s hard to get to. I need a step stool to get to it. Up there I like to store any extra items I get. If there is a sale on oatmeal or rice, I store all the extras up there. This way I am able to take advantage of sales, but I keep it to just basics and am able to store them in that otherwise unusable inconvenient space. I keep a running checklist inside of my pantry door to keep tabs on what I have. Especially those items I keep on that top shelf I just mentioned. It’s been super helpful with things like soups and purees too as those often get forgotten since they are all lined up at the back of the shelf. This is the best way I’ve found to keep fresh in mind what I do have because let’s be honest – mom life is busy! When we’re going to reach for something to make dinner we grab what we immediately see. And if you’re doing five million things at once the last thing you want to do is dig through your small awkward pantry to figure out what you have! 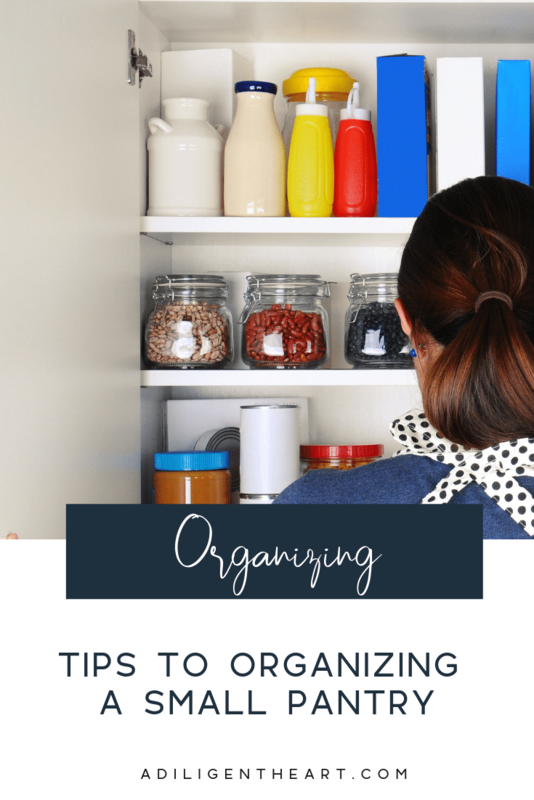 This post was originally part of the #30DayOrganize challenge in 2016. You can find all the amazing posts in the link below!! If you choose to join in on some of the challenges now, tag me on Instagram so I can check it out! 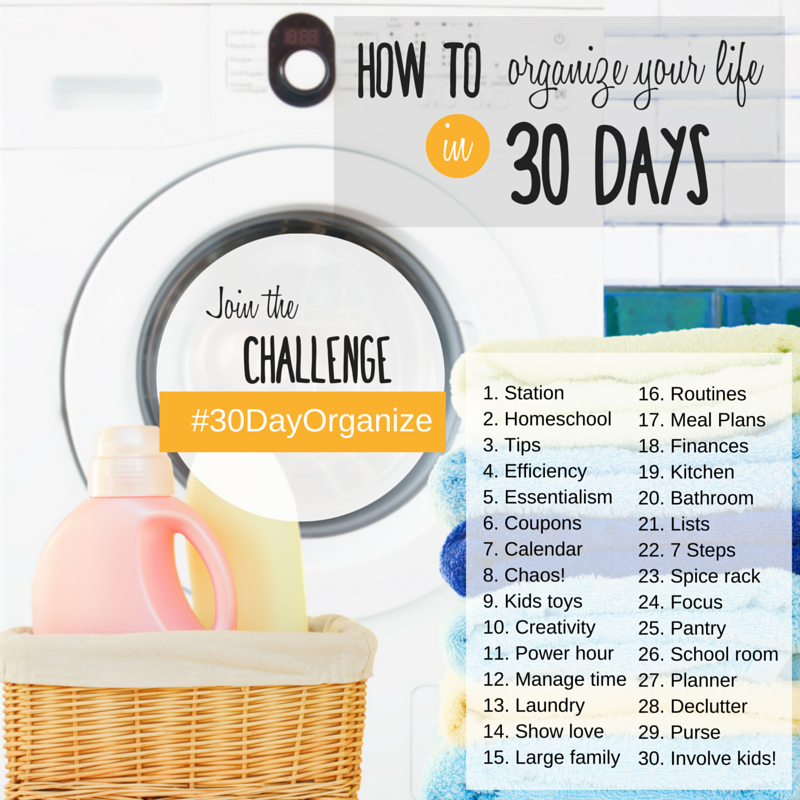 Join us for the “How to Organize your Life in 30 Days” Challenge! 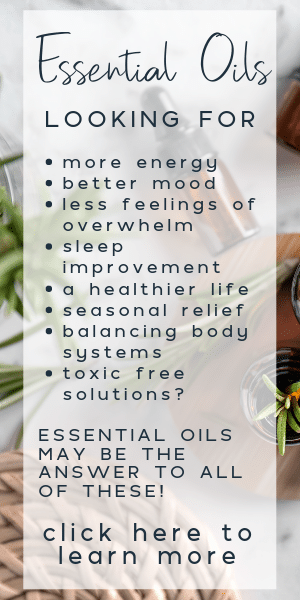 Do you feel like you are drowning in to do lists, laundry, and dishes? Does lack of organization cause you to lose your patience or avoid having people over? Are you often late because you can’t find what you are looking for? As mom’s, we all have a lot on our minds and life is busy. In some seasons our mind becomes so full that we become less productive. I am teaming up with some amazing bloggers to bring you 30 days to an organized life! All you need to do to join the challenge is check out the landing page HERE and start working through the challenges. You can join in at any point, there are no rules! Share your before or after pictures on Instagram and use the hashtag ‪#‎30dayorganize‬ for a chance to win a $10 gift card to Hobby Lobby (3 winners)! The more your engage on social media, share the graphic above, etc. the more entries you’ll have! The winners will be announced on Instagram so stay tuned!